Give your Moodle a makeover and embed social content in your online classroom. This post is about embedding your curated content in a Moodle using four of my favourite services: Twitter, Pinterest, Youtube and Storify. With these tools you can easily transform your Moodle module into a dynamic and engaging learning space that can captivate students and increase their online engagement. The popularity and ubiquity of social media makes a compelling argument for integrating such technologies into higher education. Moreover, as the information and digital content we consume is increasingly created and shared through aggregation, filtering and customisation it is imperative that educators (especially those working in create media) provide opportunities for students to do likewise (Mills, 2013). Through strategic curation we can give students a variety of learning experiences and provide avenues for students to connect lecture topics and lesson content with their various disciplines and creative media practices. By giving students more opportunities to incorporate their everyday digital practices and personal interests into their learning, we can empower them to access, analyse, evaluate, and create media more effectively. In line with a multimodal approach to learning, such resources should not be considered as optional extras, but as key student engagement opportunities, which provide depth and critical articulation of concepts. If you need a little more convincing or want some advice on how to curate for education then check out the following article Why Curation Revolutionizes Education & Learning. Step One: Generate some widget HTML code for the content you have curated. Step Two: Add the widget HTML code to your Moodle module. There are several ways we can add HTML code so that your content displays on your Moodle module. In this post, I will explain the process embedding content within a Moodle HTML block, label and page. But first we will need to choose a service, curate some content and generate the widget code. Social media, content curation and publishing sites such as Facebook, Instagram, Vimeo, Soundcloud, Slideshare, Issuu, and Feedly can easily be added to your Moodle module. Google the service you want plus the phrase ‘HTML embed code’ and you should be able to find it. In my Moodle module I use Pinterest, Youtube, Twitter and Storify. Below you will find links and videos to guide you through the process of generating HTML embed code for each of these services and a little bit about how and why I use these services in my teaching practice at SAE Creative Media Institute. Pinterest has quickly become my favourite way of organising and presenting digital content, brainstorming ideas, collating teaching resources and planning lessons. The option to invite others to pin to your ‘community board’ make collaboration easy, while the visual nature of Pinterest makes it a great way to engage students. 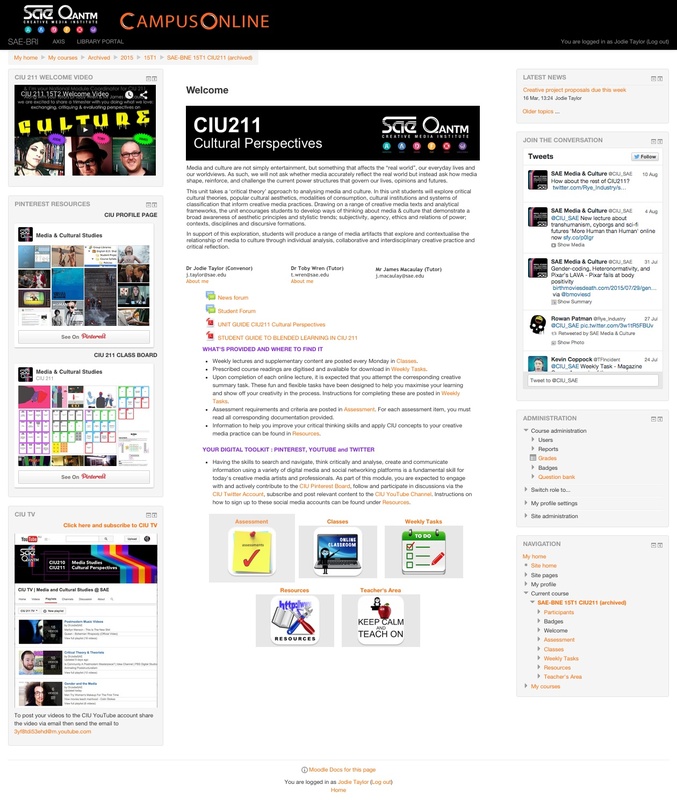 Here’s a link to the media and cultural studies Pinterest profile I created for my students. Visit Media & Cultural Studies’s profile on Pinterest. You can add a Pinterest profile widget widget (like the one above) or a board widget (like the one below) in Moodle using Pinterest’s Official Widget Builder. Detailed instructions can be accessed at the link provided or you can watch this step by step video tutorial to see for yourself. ● The Educator’s Guide to Pinterest (2015). ● 37 Ways Teachers can use Pinterest in the Classroom (2012). ● The Pinterest Guide for Teachers (2013). ● Pinterest for Educators: From Beginner to Advanced User (2015). Follow Media and Cultural Studies’s board Pinterest for Educators on Pinterest. Many of us will already use Youtube videos in our classrooms and Moodle modules, but how are you organising and embedding this content, and could you do this more effectively? CIU TV is a Youtube channel of supplementary video materials, which I have especially curated for my CIU 211 and 210 students. As you will notice, each week’s class has a corresponding CIU TV playlist, which I embed into the weekly lesson page under the ‘Classes’ tab within Campus Online. You can add a single video or a curated playlist to Moodle using Youtube’s embed function. Instructions can be accessed at the link provided or you can watch this step by step video tutorial to see for yourself. Twitter is one of the best ways to get students conversing on lesson topics and critiquing media content after hours and is a great platform to encourage students to connect with experts and peers, source various opinions on an issue, engage in conversation and share their work and discoveries in real time. As anyone who uses Twitter will know, it is much easier and more appealing to tweet a thought than log into Campus Online and post to your class discussion forum. You can check out my classroom Twitter account here. The best way to display tweets from Twitter is in a Moodle HTML block using Twitter’s official widget tool. You can choose if you want to display tweets from a single account, from multiple accounts, your own favourite tweets or tweets based on a search such as a hashtag. To do this, you will need the HTML code which you can get using the official Twitter Widget Configurator Tool. Detailed instructions can be accessed at the link or you can watch this step by step video tutorial to see for yourself. Storify is a social network service that lets the user create stories or timelines using social media such as Youtube, Twitter, Facebook and Instagram and anything else you can find on the net. I use Storify to narrate and publish complete online lessons which I then embed into a Moodle page. You can check out my lessons on Storify below. If you haven’t used Storify before try their guided tour and watch this video, which takes you through the entire process of creating a story and embedding it into another website. Now that we’ve covered how we create content and generate embed codes, let’s take a look at how we get it into Moodle. Anyone wishing for more detailed instruction on using Moodle can search the online Moodle user manual available at this link. ● Click Turn on editing. ● Select Add activity or resource and choose either Label or Page. Once the configuration window has opened, you will need to add content to the content frame. When we are embedding HTML code into any type of Moodle resource, we must do this using the HTML source window, which we can access via the HTML button in the toolbar. You will need expand the toolbar using the Toolbar Toggle button first to show this. Now simply paste your embed code for the content you want displayed here and save. Scroll down the page until you find the Add a block on the right-hand column. Click add then select HTML from the drop-down list. Now that the HTML block is added to your module you will need to click on the gear icon in the top right corner of the new block and select Configure HTML block. Once the configuration window has opened, you will need to add content to the content frame. This process is the same as adding it to any other resource. Simply toggle to the HTML button, paste your code and save. While configuring your HTML box you also have the option of selecting what Moodle pages it will appear on and where it will appear on the Moodle page. Here’s a screen shot of one of my Moodle module welcome pages. Click on the image to open it and zoom in.